Here’s another find at the Mercato Centrale weekend market, from the lady that sells Moroccan food. Zaalook is a “warm aubergine salad tapenade” with tomatoes, cilantro, garlic and spices (I think paprika being the dominant one). It was delicious, and at PHP75 for a small container, perfect for folks just looking for a single serving healthy snack or dip. I have returned to this Moroccan table several times over the past few months, and I appreciate the variety they bring to the market. The classic accompaniment to the Zaalook is some Batboot, a moroccan version of pita bread. The one in the photo was particularly fresh and incredibly satisfying. Maybe it’s just because I have had no carbohydrates for weeks, but I really liked the texture, flavor and heft of the Batboot. Nicely done indeed. And yes, a perfect vessel to scoop up the Zaalook. I ate one tiny triangle of bread with the eggplant dip. is this what they call here as eggplant caviar?? ?looks so good. It’s there on sundays! I love this stall. I’ve been looking for a Middle Eastern grocery as well. In particular I’m looking for Fava Beans (aka Broad Beans). I’ve tried all my known Indian grocers, but they don’t seem to have them. Any ideas / confirmed sightings? I have WASA crackers sitting in the fridge since December feeling cold and depressed to see other foodstuff leave. teresa@ yes spices n flavours have zaatar. Lee- living in WASA country, I thought I should promote its health qualities and crispy appeal. The latter disappears however as soon the cracker is exposed to humidity. I suggest you warm the crackers in a 75-100C oven for ca 10 mins or so and you’ll notice that they taste better and crispier. Moroccan food is my favourite food at the moment as it’s well flavoured – savoury with a hint of sweetness at the same time. Argan oil in mixed salads is just out of this world! Teresa…if you have any spices at home like oregano, thyme, marjoram or maybe savory, cumin, you can make your own…a pinch of this and that. You need sumac though to make zaatar. You can customize your blend to suit your taste. Who knows, you can come up with your own blend and have a spice home business like Tupperwarer parties! MM…great accompaniment to Eggplant dips is this Persian flatbread that looks like naan but a lot thinner than naan and unleavened as well. I forgot what it is called. It is addicting and chewy. 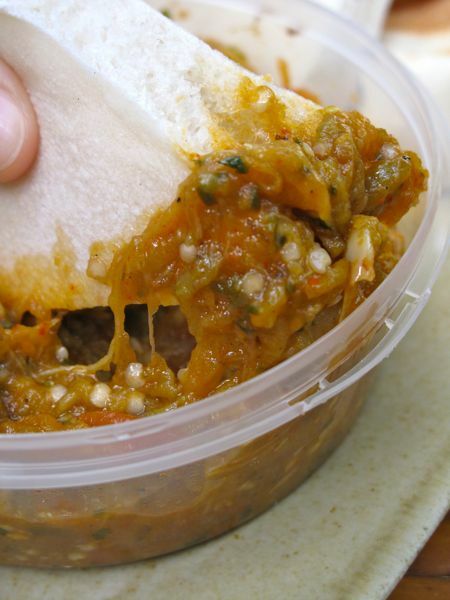 Here is a great vegetarian pocket…a scoop of your Zaalouk, a tbsp. of sauteed herbed carrots or zucchini, roasted peppers and caramelized onions with a pinch of tarragon. looks good, MM. 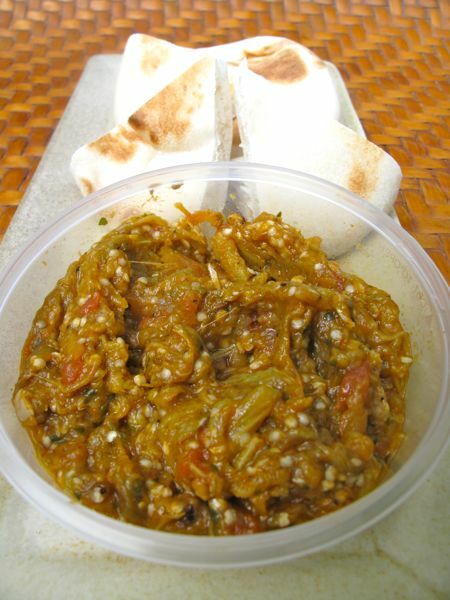 We also have similar kind of eggplant salad in Cebu. We usually have eggplant, sibuyas dahon, sibuyas bombay, ahos , tomatoes and of course, ginamos. But WASA, no way. Wa jud ni lami taste like papel o karton. He he he ! So poor you! Good luck na lang sa imong diet. My friend Anca,from Romania, makes a good eggplant dip, simply grill eggplant ,peel, mashed it, lots of mashed grilled garlic in grapeseed oil ,salt .pepper and spices of your choice, and more grapeseed oil. 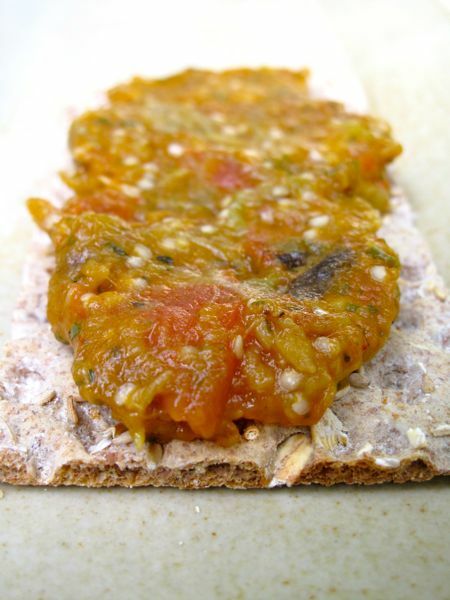 serve warm on wasa crackers… or bread of you choice,its simple, but yummy..